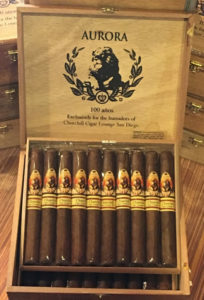 Churchill Cigar Lounge in conjunction with La Aurora Cigars proudly presents its newest and possibly best house blend. This exquisite pure Dominican blend is comprised of 14 year old tobacco covered in a Corojo wrapper which produces smooth flavors of leather and cedar. Only 1500 cigars were produced for us and in one size a 5 1/2 x 42 corona with each cigar individually numbered. These are available at both our Old Town and Miramar locations. Grab one or more before they are gone.